WBCS Answer Key 2019 Prelims Solved Question Paper Download Out ! WBCS Answer Key 2019 (unofficial) available now for Download. Set Wise WBCS 2019 Prelims Answer Key will soon be uploaded in this page. So, after the exam held on 9th February 2019, aspirants can stick to this page for further updates on Official/Unofficial Solutions. Also download the WBCS Prelims 2019 Solved Question Paper PDF from the link in Bengali & English Language for Set A, Set B, Set C & Set D.
Check here WBCS Expected Cut Off Marks 2019 Prelims Exam Category Wise !!! 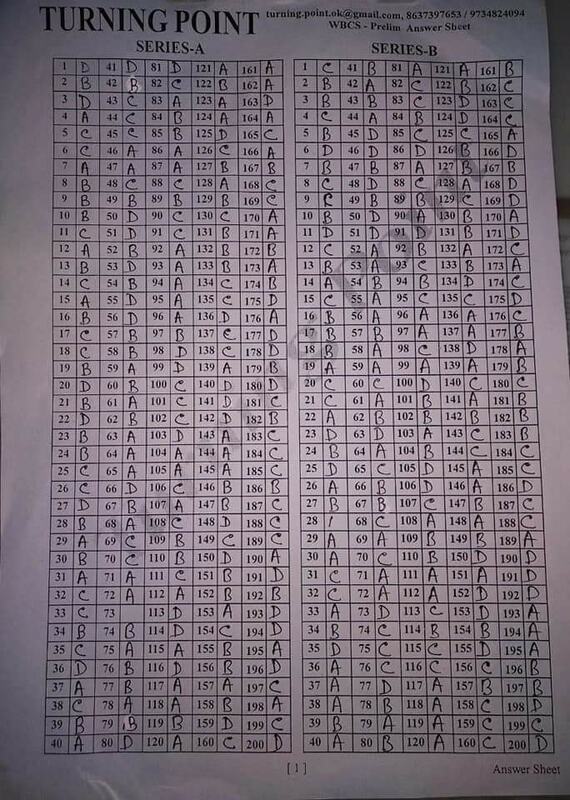 WBCS 2019 SET B Answer Key – Click here. (TICS Coaching Center). SET A & SET B Answer Key – Click here. (Turning Point Coaching Center). WBCS Answer Key 2019 solved question paper Preliminary Examination held on 9 February has been posted here. We have given WBCS 2019 Question Paper in PDF format in Bengali and English both language. We will soon try to be publish the solution for the SET. Expected set wise answer key and solution can be discussed here in the comments section. Candidates who appeared in the preliminary written exam held on 09-02-2019 can check their answer key to guess the marks obtained in the preliminary exam. The set wise answer key also may be published by the West Bengal Public Service Commission for the WBCS 2019. WBPSC earlier year didn’t published the individual OMR sheet for the WB Civil Service exam. This year also it is not expected that the solution/ answer keys / OMR sheet (individual) will be published. Single paper was there for the written exam in West Bengal Civil Service 2017. The paper was of 2.5 hours that is 150 minutes. OMR sheet was given to candidates to mark answers for WBCS 2019 prelims exam. The exam was based on offline. Candidates were to reach the exam hall 30 minutes before the exam started to complete all the formalities. Candidates from all West Bengal appeared in the written preliminary exam. If you have any doubt regarding answer of any question, you may discuss in the comment section below with explanation set wise (Set A Set B Set C Set D). Also we will try to publish the answer key and solved question paper held on 9th February 2019 very soon. Various coaching centers also published the expected solution and answer key for the WBCS 2017 Preliminary Exam. You can cross check your answers with other candidates to make sure whether you marked it correct or not. The model answer and solution for Set A, Set B, Set C and Set D may be uploaded to the official website. The solved question paper also can be downloaded from the link give below when the WBPSC authority uploads it on their official portal. The question paper was bilingual that is in English and Bengali. Earlier candidates were provided e-admission certificate to the exam hall on their official website www.pscwb.org.in. Officially WBCS 2019 Answer Key has not been published yet. We will update the download link for the official answer key or fully solved question paper if it is published on their official portal. Keep your eyes on www.jobsandhan.com for latest updates related to West Bengal Civil Service Exam. I appeared the wbcs preliminary exam 2019 as a general candidate. Most probably my score will be in between 99-101 after deducting the negatives. Is there any chance for the main? I am OBC – B category. My score will be 100 after deduction negative Mark’s in WBCS, Preli 2019.Can I get chance for main? When the WBPSC Miscellaneous 2018 declared ? When the result of WBPSC Miscellaneous 2018 would be declared ? The answer given in the answer key of question number 60 is wrong….it should be option B and not option C.
kobe wbcs psc preliminary exam er result out hbe? Sir when wbpsc prilim result will decleare.